…which is not, in and of itself, a bad thing at all. GA was always treated a something of a Batman knock-off in his earliest appearances,and was definitely treated as a surrogate Batman in his appearances on SMALLVILLE. BATMAN is as hot as ever but the WB seems to be a little shy in allowing Bruce Wayne et al to grace our presences on the home version of the wide-screen. Coming soon? 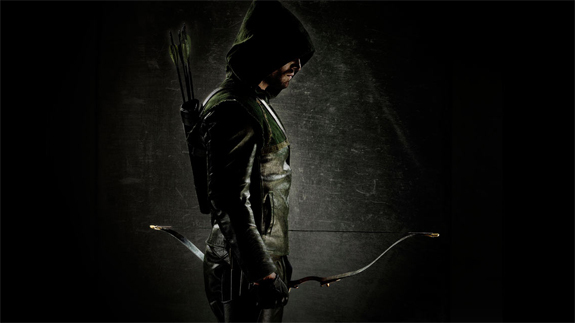 GREEN ARROW on the small screen. Hopefully with a little more reverence for the core concepts than David E. Kelley managed to muster for WONDER WOMAN. Previous PostTHE COMIC BOOK LOUNGE isn’t LOST in SPACE! !Next PostHere’s how things looked in our recent appearance on SPACE: THE IMAGINATION STATION!